There is something special about a magical garden wedding ceremony in Brisbane. 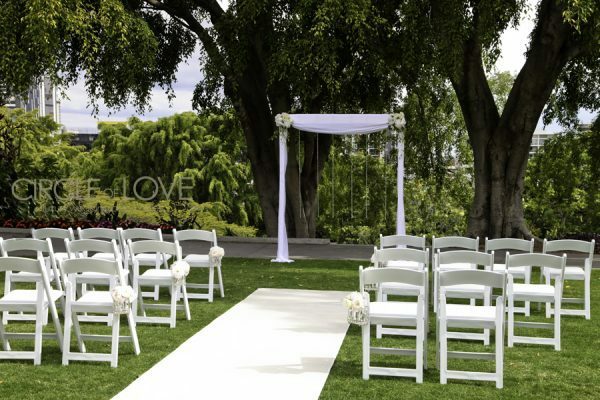 Exchanging your vows in the serenity of a garden, surrounded by natural beauty and your closest family and friends. 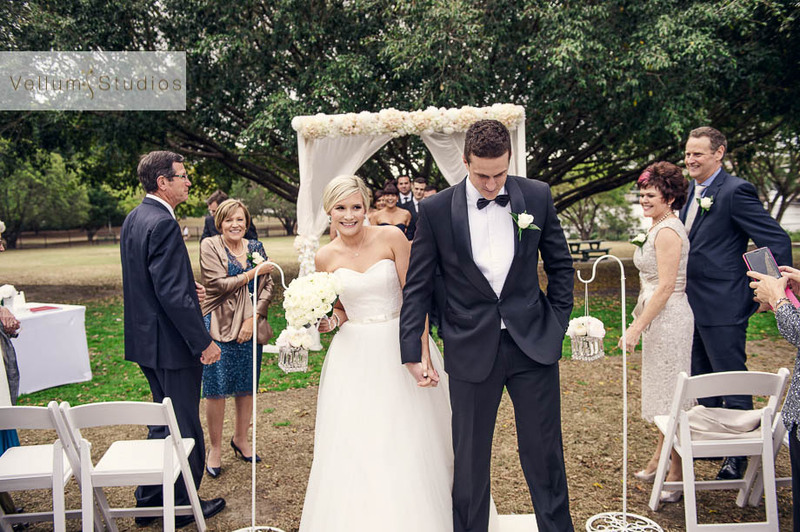 There are many gorgeous garden wedding venues in Brisbane, providing you with a stunning backdrop for your photographs. 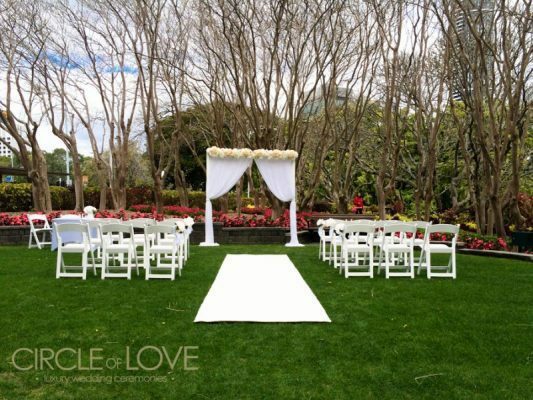 Here is a selection of garden wedding ceremony locations in Brisbane that Circle of Love recommends. Where you can have your garden ceremony and then to the wedding reception all in the same city. See more about Roma Street Parklands weddings here. 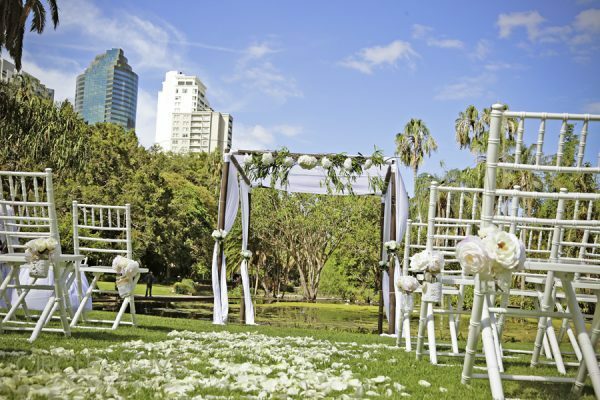 The Brisbane City Botanic Gardens Wedding venue has many location options to choose from. With full-time gardeners these gardens are immaculate, lush florals everywhere you turn, complemented by natural lakes and water features. 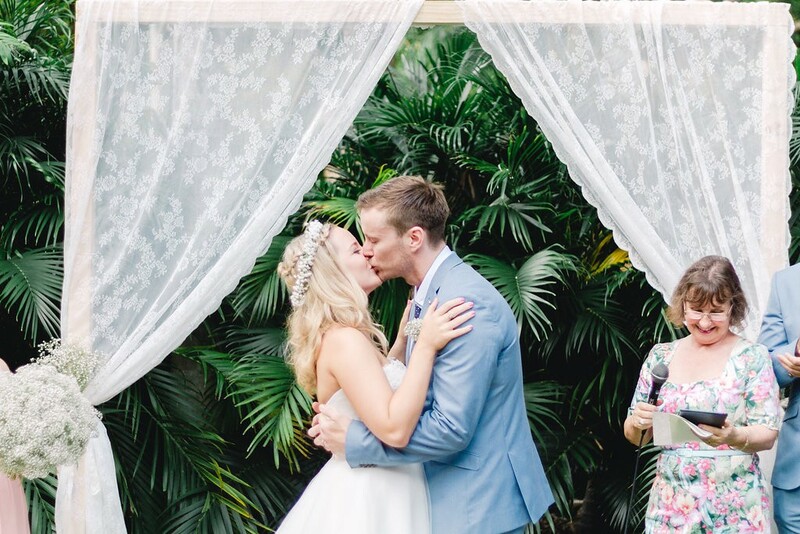 There are many photo opportunities for your special day, with views of the famous Brisbane story bride and man-made boardwalks through the mangroves..we just love this garden wedding ceremony location in every way. See more about Brisbane City Botanic Gardens Weddings here. 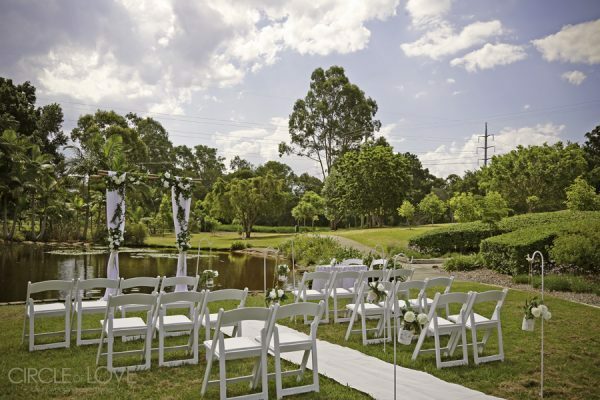 New Farm park garden wedding venue situated on the picturesque Brisbane river offers a choice of 4 wedding ceremony locations that can be secured through Brisbane City Council. One of our favourites is the New Farm Park Rotunda, this is an elevated rotunda that provides shade, shelter and is an empty canvas for us to work our magic on. Our next favourite garden wedding venue at New Farm Park would be the ‘Powerhouse View’, located next to the famous Brisbane Powerhouse, this location offers large trees to create a perfect backdrop for your wedding ceremony. Other locations at New Farm park include the ‘River View’ and ‘Ferry View’. New Farm Park is also famous for its glorious rose gardens, jacarandas and poincianas. See more about New Farm Park – Brisbane City here. Looking at having your wedding at Kangaroo Point contact us to discuss the number of options of locations. 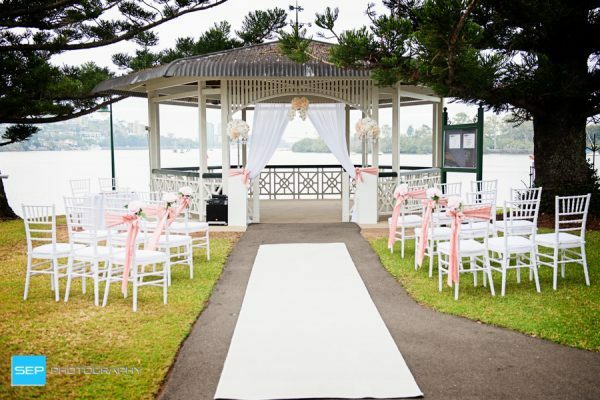 Captain Burke Park Wedding ceremony location at Kangaroo Point has to be one of our favourites. It has two designated sites for park bookings for special events of short duration. The inner city riverfront park is located below the Story Bridge, with city and river views and is located close to the Holman Street ferry terminal. Many of the venues in the area which host wedding receptions also have the ability to hold ceremonies within their grounds. Many of these enjoy river and city views and can be a great option. Kangaroo Point is situated on the edge of the Brisbane River at the bottom of the famous Kangaroo cliffs. To secure your wedding ceremony here you would need to contact Riverlife. Riverlife also offers another reception venue options that overlook the city skyline and river, while in the comfort of their outdoor marquees. See more about Riverlife Kangaroo Point here. Newstead Park Wedding location in Brisbane is a beautiful garden located alongside of the Brisbane river. There are many trees to offer shade and a jetty on the water, for the perfect bridal entry. At the point of the gardens, you’ll find the Newstead Park Wedding Rotunda. An attractive gazebo with a backdrop of the Brisbane river and city outline. This is one of the better ceremony locations within the Brisbane area. To book this beautiful picturesque Brisbane River City Wedding location – click here. Orleigh Park a hidden gem in Brisbane, is located close to the Southbank precinct. Located amongst some of the best of Brisbane’s wedding venues including the Gunshop Cafe, the Brisbane Yacht Club and more. Orleigh Park offers 3 designated wedding locations for your ceremony. 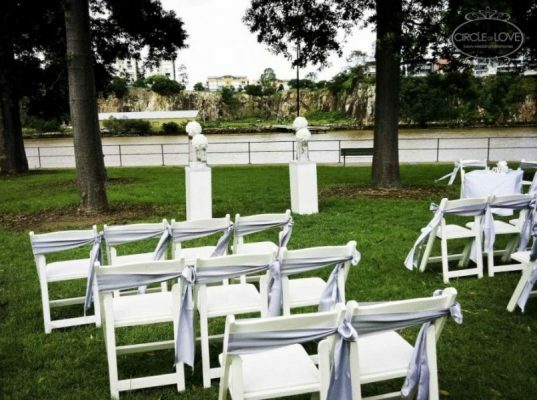 One ceremony location that overlooks the Brisbane River, as well as two other locations that are quite popular as they are less public and have some stunning natural features. See more about Orleigh Park West End here. 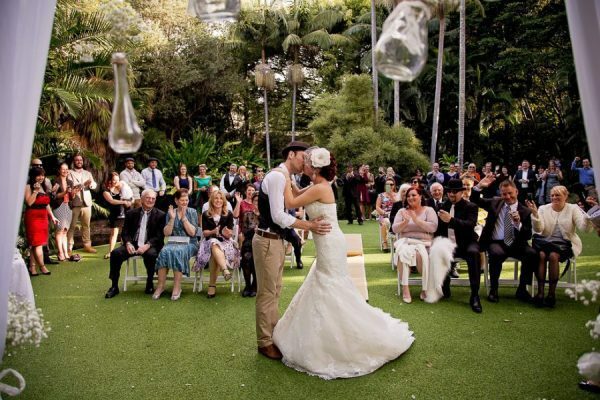 Mt Coot-tha Botanic Gardens Weddings is a picturesque location located 10 minutes from the CBD. Mt Coot-tha Botanic is enchanting, breathtaking & picturesque, with tranquil backdrops this wedding ceremony location is a must see. See more about Mt Coot-tha Botanic Gardens here. The famous Brisbane Powerhouse is a unique ceremony location with splendorous trees and Brisbane river views, this ceremony venue sets a perfect backdrop for your ‘I Dos.’ Surrounding Brisbane Powerhouse is the exquisite New Farm Park gardens where you can capture some amazing photos. Brisbane Powerhouse wedding reception venue offers various reception styles from cocktail or sit down as well as two bar/restaurants to keep your guests entertained. See more about Brisbane Powerhouse Wedding here. 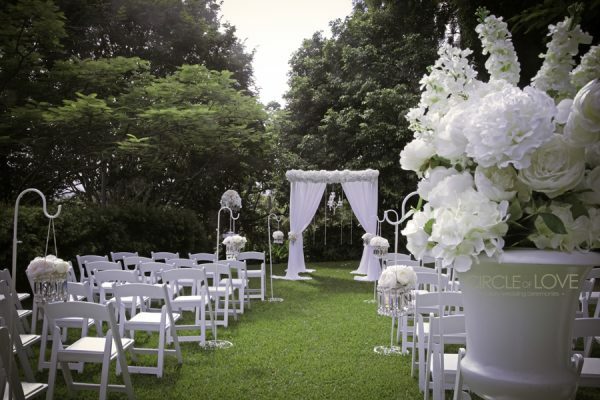 Want a picturesque garden wedding on the south side of Brisbane? Underwood Park has a beautiful landscape with lushes gardens and a gorgeous pond at the heart of this divine ceremony location. Couples who love gazebos there is one here. Suitable for a small wedding the gazebo is positioned just in front of the pond. Want to see more about Underwood Park weddings here. Looking for a seaside wedding, then Cleveland wedding location is the place for you. There is a number of gorgeous beach and garden wedding ceremony locations at your doorstep including the famous Cleveland Lighthouse. Want to see more about Cleveland wedding locations and venues here. Located by Morten Bay, Moora Park is located along the foreshores of Shorncliffe. At the top of the cliff, there is a beautiful rotunda, surrounded by well-manicured gardens providing the perfect backdrop to exchange your ‘I Do’s. 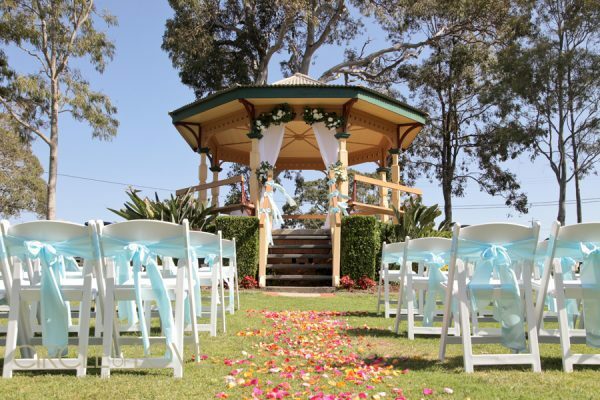 Want to see more about Moora Park Shorncliffe Weddings here. 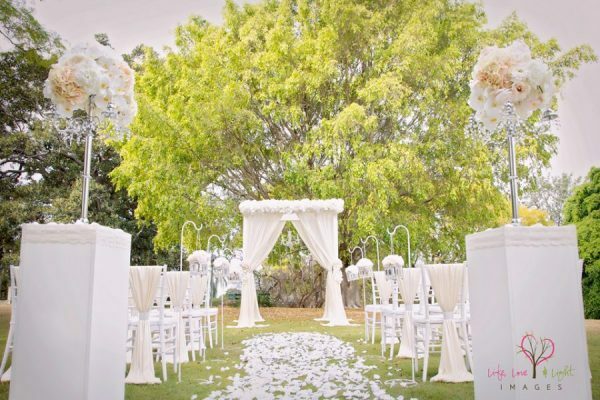 We hope we have helped narrow down your search with our list of garden wedding venue ins Brisbane. Brisbane has an array of beautiful wedding venues so we know it can be hard to choose but we are here to help! We specialise in Brisbane Wedding Ceremonies, whether it be in a garden park, chapel or church we have a styling range that will ‘Wow’ you. We are one of the leading wedding stylists in Brisbane! With a portfolio of Brisbane garden wedding venues and styling ideas, hire & packages you surely will not be disappointed. Contact us today to ensure your wedding is simply perfect.